Home » Laboratory of Molecular Biology » Ira Pastan, M.D. The discovery with R. Perlman of a new gene regulatory mechanism whereby many quiescent genes are activated by cyclic AMP and its DNA-binding partner CRP. Receptor studies which provided the first evidence that peptide hormones bind to receptors on the surface cells, and the use of fluorescence methods to visualize the binding and internalization of insulin and other ligands by living cells, to measure their diffusion rates on the membrane before clustering and internalization, and to demonstrate that different ligands, including viruses, enter cells together in the same vesicles. Research on the EGF receptor, which showed that the EGF-R (onco)gene is amplified and over-expressed in many human cancers, the cloning and sequencing of the EGF-R cDNA and with Doug Lowy, the demonstration that over-expression of EGF-R in the presence of EGF can transform normal cells into cancer cells. These studies provided essential evidence that antibodies able to inactivate the EGF receptor could be useful in treating many cancers. Studies with M. Gottesman on the biochemical basis of multi-drug resistance in cancer therapy, which involved the isolation of the first human multi-drug resistance gene (MDR1) gene and the demonstration that MDR1 encodes a multi-drug transporter that is highly expressed in many human cancers. The development of recombinant immunotoxins for the treatment of cancer.. Working with R. Kreitman and D. FitzGerald, I used protein engineering to produce novel chimeric proteins composed of an Fv that targets a protein on the surface of a cancer cell and a portion of a powerful protein toxin. One of these Lumoxiti has been approved by the FDA for the treatment of leukemia. The discovery of mesothelin (with M.C. Willingham) and the demonstration that it is an excellent target for antibody based cancer therapies, because of its high expression on many cancers and lack of expression on essential normal organs. 1.2 million Americans develop cancer each year and about 500,000 die from the disease. To improve the therapy of cancer new approaches and drugs with new mechanisms of action are needed. To accomplish this we have employed genetic engineering to modify a potent bacterial toxin, kill many so that it kills cancer cells. Pseudomonas exotoxin A (PE) is a three-domain protein. We have produced anti-cancer agents by deleting the binding domain of PE and replacing it with the Fv portion of an antibody that directs the toxin to a target on cancer cells. These agents are termed "recombinant immunotoxins" (RITs). They kill cells by arresting protein synthesis, a mechanism not employed by other anti-cancer agents. Therefore, they can kill drug resistant cells. Several different recombinant immunotoxins have been developed in our laboratory and we are now conducting clinical trials with 2 of them. 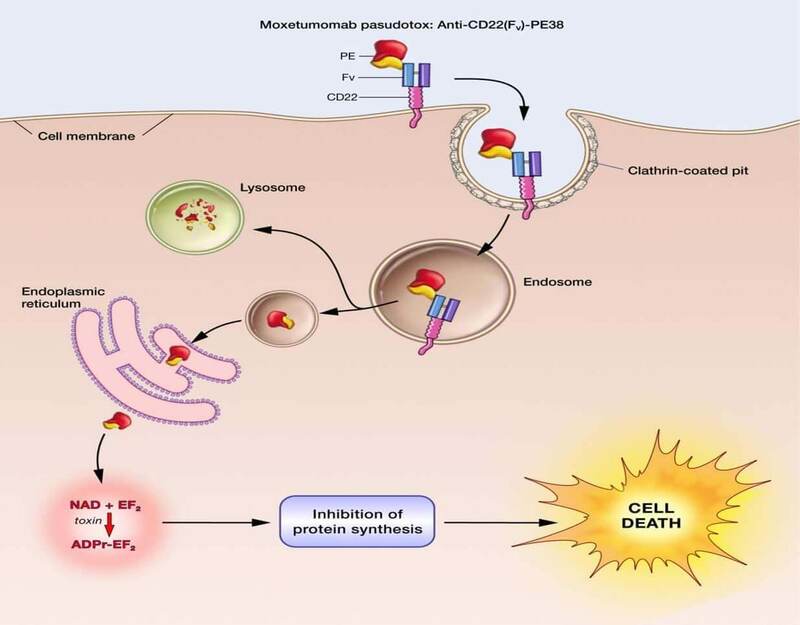 Moxetumomab pasudotox (Lumoxiti) targets CD22 on B cell malignancies and has been approved by the FDA to treat drug resistant Hairy Cell Leukemia. LMB-100 targets mesothelin present on mesothelioma and many other epithelial cancers (pancreas, ovary, lung, bile duct and triple negative breast cancer). We are carrying out clinical trials in mesothelioma and pancreatic cancer. View Dr. Pastan's PubMed Summary. Strategies to reduce the immunogenicity of recombinant immunotoxins. Mazor, R., King, E.M., and Pastan, I.
Mesothelin Immunotherapy for Cancer: Ready for Prime Time?. Hassan R., Thomas, A., Alewine, C., Le, D.T., Jaffee, E.M., and Pastan, I.
Recombinant immunotoxins targeting B-cell maturation antigen are cytotoxic to myeloma cell lines and myeloma cells from patients. Bera, T.K., Abe, Y., Ise, T., Oberle, A., Gallardo, D., Liu, X.-F., Nagata, S., Binder M., and Pastan I. In Vitro and In Vivo Activity of the Low-Immunogenic Antimesothelin Immunotoxin RG7787 in Pancreatic Cancer. Hollevoet, K., Mason-Osann, E., Liu, X.-F., Imhof-Jung, S., Niederfellner, G., and Pastan, I. Combining local immunotoxins targeting mesothelin with CTLA-4 blockade synergistically eradicates murine cancer by promoting anti-cancer immunity. Leshem, Y., O’Brien, J., Liu, X., Bera, T.K., Terabe, M., Berzofsky, J.A., Bossenmaier, B., Niederfellner, G., Tai, C.-H., Reiter, Y., and Pastan, I.
Dr. Ira Pastan was educated at the Boston Public Latin School, Tufts College, and Tufts Medical School. He did his residency at the Yale School of Medicine (1957-1959) and came to NIH in 1959. In 1970, he founded the Laboratory of Molecular Biology in the NCI. The Food and Drug Administration (FDA) has approved moxetumomab pasudotox (Lumoxiti), a bacterial toxin–based drug, for the treatment of some patients with hairy cell leukemia (HCL). The approval covers the use of moxetumomab in patients with HCL who have already undergone at least two lines of standard treatments. The action by FDA makes moxetumomab the first treatment approved for this group of patients. The approval was based on the findings from an 80-patient clinical trial sponsored by the drug’s manufacturer, MedImmune. In the trial, approximately 30% of patients had a complete disappearance of their cancer (complete response) that lasted for a long period, and side effects from the therapy were few and mostly minor. Overall, 75% of patients in the trial had either a partial response or complete response. Moxetumomab was originally discovered by Ira Pastan, M.D., and colleagues in NCI’s Center for Cancer Research (CCR), and later licensed to MedImmune/AstraZeneca for clinical development. Many people diagnosed with HCL will achieve remission with current treatments, explained the trial’s lead investigator, Robert Kreitman, M.D., of CCR's Laboratory of Molecular Biology. “But about 30%–40% of those patients will relapse 5 to 10 years after their first treatment,” Dr. Kreitman continued. As patients receive further treatments, although they may go into remission again, the length of those remissions gets shorter and shorter, and the toxicities of the treatments accumulate, he explained. For these patients, few effective treatments exist, which is what makes this new approval so important. “Moxetumomab represents a promising nonchemotherapeutic treatment for HCL, addressing an unmet medical need for patients,” Dr. Kreitman said. Moxetumomab includes a special boxed warning for clinicians and patients about the risk of capillary leak syndrome, in which fluid and proteins leak out of tiny blood vessels into surrounding tissues. Further details on moxetumomab and the clinical trial on which FDA's approval was based are available in this June 2018 Cancer Currents post.